This doesn't mean anything. I hope. Every few years, another locally published, small-press book comes out about Neapolitan hand gestures. These gestures are a bit of local culture that charms the rest of the world; after all, everyone knows that "Italians talk with their hands." 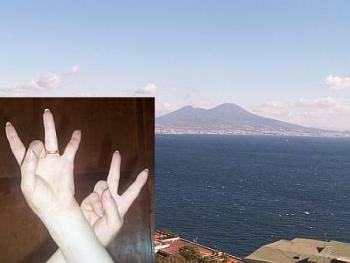 (That, of course, is wrong; southern Italians talk with their hands. Northern Italians, by comparison, lumber about as if they're auditioning for Invasion of the Crippled Skiers). Indeed, there are entire dictionaries hidden and not so hidden in every Neapolitan hand wave, knuckle turn, and finger waggle. All this is helpful. Suppose, for example, you loosen your enraged grip on the steering wheel just enough to raise the index and little finger to that driver of the car that has just cut you off. Yes, you may think you are simply expressing your solidarity with the "Longhorn" football team from the University of Texas, but that benighted soul in the other car (who is totally ignorant of college sports in the US) will understand your gesture as a suggestion that his wife, the lovely woman next to him in the front seat and the mother of his children, is betraying him, and he will be honor-bound to run you off the road and have his own good-old college try at taking your life. If the authors of these books have bibliographies, they never plug the competition, that is, other recent books similar to their own. They all, however, do cite the granddaddy of all such books about Neapolitan gestures, a volume you will not find in your run-of-the-mill bookshop: La mimica degli antichi investigate nel gestire napoletano, by Andrea de Jorio (“The Mimicry of Ancient Peoples Investigated through Neapolitan Gestures”). It was published in 1832 and drifted into obscurity for many years. In his 1964 book, The Italians, Luigi Barzini mentions de Jorio's work and laments the fact that so little has been written about the language of gestures. Since 1964, of course, formal studies of sign languages and general body language have become part and parcel of the disciplines of linguistics, communications, and anthropology. Entire curricula are devoted to the semiotics of gestures, so it is natural that de Jorio's book should have made a comeback, which, indeed, it has. The book has been republished in Italian three times in recent years: 1964, 1979, and 2002. All of the reprints are photographic copes of the original edition plus explanatory notes. The volume also appeared recently (2000) in a scholarly and annotated English translation by Adam Kendon as Gesture in Naples and Gesture in Classical Antiquity (Indiana University Press). There are at least two fine reviews of the English translation that I know of, both of which praise the original as well as the erudite translation, which includes an 80-page essay/introduction. The first review is "The Neapolitan Finger" by Joan Acocella; it appeared in the The New York Review of Books in the year 2000 and then in 2002 in Sign Language Studies, a journal published by Gallaudet University. The other review is by Giovanna Ceserani of Princeton University; it appeared in the Bryn Mawr Classical Review in 2003. De Jorio (1769-1851) was born on the tiny island of Procida, a brief sail from the mainland, ancient Cumae and that treasure trove of Greco-Roman mythology known as the Flegrean Fields. It was also a time when the archaeological sites at Pompeii and Herculaneum were opening up. De Jorio became a canon at the Naples cathedral but was born to be a classical scholar and archaeologist. He wound up as curator of the Royal Bourbon Museum, now the National Archaeological museum. His purpose in writing about gestures, he said, was to show the continuity between the classical world and the modern one. Look at the hand gestures on these old vases, he said. They are the same ones we use today. Unlike today, such body language was not particularly interesting to scholars of the early 19th century. It might even have been amusing to the Grand Tourists of the day and even have fit into the broad stereotyping of Neapolitans that travelers from Goethe to Mark Twain indulged in (after perhaps one whole carriage trip down the Riviera di Chiaia): the confusion, noise, clatter, color, and the bizarre juxtaposition of pompous one-horse dukes and abject beggars. Maybe the frantically gesticulating locals fit their preconceptions—frantic hand-gibberish or something like that (which the gestures, of course, are not). De Jorio was no doubt proud to present his compendium as part of classical studies, direct from Naples, one of the hubs of Magna Grecia, the site of important archaeology in the study of ancient Rome, and one of the centers of classical scholarship in Europe. Yes, German scholars of the same period had swarmed through the southern Italian peninsula, but if you thought northern Italians couldn't move, wait till you see German professors not move. What would they know about hand gestures?